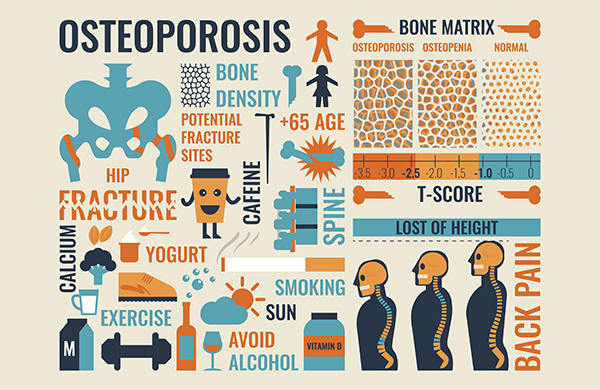 The World Osteoporosis Day has a theme this year of: “Love your bones, Protect your future”, urging people to take early action to protect their bone and muscle health. Calcium is crucial to bone health, and most of us do not get enough of this mineral in our early life, when it matters the most. The daily requirement of Calcium in adult life is about 1000 – 1300 mg/ day. It is extremely difficult to reach this figure unless you know how to combine foods. Try having 1 cup low fat milk/ Soy milk with your breakfast in the morning: Maybe as a smoothie/ with oats/ cereal/ just plain, or with a nutritional supplement. Depending on what you add, you will get about 200 – 300 mg. of Calcium already. Have 1 cup Yoghurt (Low fat/ homemade) some time through the day: Maybe with lunch, or with fruit as an evening snack. You will get about 250 mg. of calcium here. The bread, chapatti, idli, dosa, khakra, and other carbohydrates that you eat through the day will give you about 10 mg. Calcium each. The dals, lentils, and beans that you eat (white beans are higher in calcium, and soy beans are packed with calcium) will give you another 20-40 mg. of Calcium per cooked ½ cup. If you eat nuts, seeds (make sure there is 1 tbsp. sesame seeds), and dry fruits (about 1/3rd cup), this will give you another 80 mg. of Calcium. Maybe you will also eat a slice of Cheese (1 slice is 200 mg), or Paneer (50 mg. in ½ cup), or Tofu (200 mg in ½ cup), or an Egg (25 mg), or some Chicken (21 mg. in about a cup), Fish (15 mg in a cup), Quinoa in salad (60 mg in a cooked cup), or other Vegetables (30-40 mg. per cup), or maybe an Ice-cream (85 mg in 1/2 cup serving), or other Dessert (15-100 mg. in ½ cup) through the day. Here is a sample diet that will give you about 1030 – 1440 mg. Calcium per day, with just about 1500 – 1600 Kcal Energy intake. Of course you might not eat with this much discipline every day. But if you remember how important calcium is, and how to combine foods, you might always make sure of getting enough. Remember not to eat more than 500 mg. of calcium at a time. Do not exceed 1500 mg. Calcium in a day. Eat varied sources so that you get all nutrients. Eat moderate amount of salt and protein. Excess of both will cause loss of calcium. Do not follow this plan if you have kidney stones/ any other reason to avoid a high calcium plan. Do take an expert opinion if you do not have an idea about your exact nutritional requirements. Love your Bones and Protect your Future: Remember, the time to save is now!